- TEFL certificate price includes 280 Euros paid practice teaching that you receive after completion of the required student teaching. Intensive Hands-On Practical Course, 120+ hours. 20 hours of children practice teaching module. 20 hours of business practice teaching module. Small, intimate, enjoyable classes taught in a comfortable and professional environment. Free Internet and Photocopy Services. A Guaranteed Job teaching English in Madrid during the school year upon successful completion of the course. Summer Job opportunities and a chance to teach children in Summer Camps throughout Spain upon successful completion of the course. Canterbury is a professional association of professors and students from all over the world. Canterbury will provide successful graduates of its program a guaranteed average minimum of ten to fifteen hours a week teaching English if they so desire. No teaching experience prior to the program is required. Utilizing "FLEX" scheduling, Canterbury accommodates the needs of our participants and provides all of them with the maximum flexibility necessary to balance their time between studying, traveling, and working. Courses run every month (see course dates), with a rolling application deadline. The students in the class meet five days a week, Monday through Friday, from 10:00 am to 12:30 pm in the morning, learning theoretical topics related to teaching English as a foreign language and teaching English as a second language; and from 1:00 pm to 3:30 pm (15:30 hr.) in the afternoon, putting into practice the topics learned in the morning. The internship practice teaching of real-life students is done sometime between 5:30 pm (17:30 hr.) and 9:00 pm (21:00 hr.) in the evening. The TEFL theory portion of the course is of forty hours duration. The theory class meets every day, Monday to Thursday, for 2.5 hours a day from 10:00 am until 12:30 pm, for four weeks. The TEFL practice teaching portion of the course is also of forty hours duration, but it is divided into two equal modules of twenty hours each. The Children practices module meets every Monday and Wednesday, for 2.5 hours a day from 1:00 pm until 3:30 pm, for four weeks; and the Business English practices module meets every Tuesday and Thursday, for 2.5 hours a day from 1:00 pm until 3:30 pm, also for four weeks. The Observed Practice Teaching module is of twenty hours duration and meets every Friday for 5 hours a day from 10:00 am until 12:30 pm, and then from 1:00 pm to 3:30 pm, for four weeks; and finally the Internship Practice Teaching module is also of twenty hours duration and meets sometime between 5:30 pm (17:30 hr.) and 9:00 pm (21:00 hr.) in the evenings on a few selected days during the TEFL certification program. Thus, the course consists of forty hours of learning theory in the mornings; forty hours of lesson planning, role plays, presentations, peer teaching and critiques in the afternoons; twenty hours of observed practice classes; and twenty hours of paid internship practice teaching classes out in the field in the evenings so that students are fully prepared for ESL teaching. 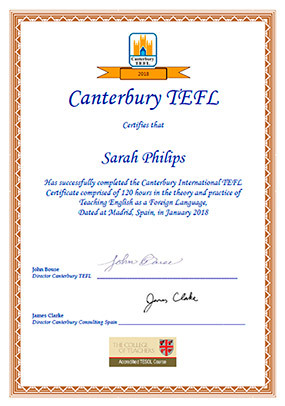 All the teachers in the Canterbury TEFL Certification Course have been involved in professional teaching and training for a number of years. They are still active teachers and therefore are fully aware of the classroom situations facing foreign language teachers, who teach abroad, today. Each group will have input from at least three teachers during the course. And don't forget that we offer guaranteed jobs in Spain for English speakers upon completion of the course! Applications are welcomed from all interested parties, regardless of nationality. The only requirements are a proficient level of English, some study at the higher educational level and a willingness to adapt to the intensive nature of the course to teach English abroad with Canterbury's TEFL Certification. The Teaching Evaluation is the most important and the overall grade cannot exceed the teaching evaluation grade. The written work and theory grade are there to give credit to the students who are strong on academic work and to fully prepare students for ESL teaching. 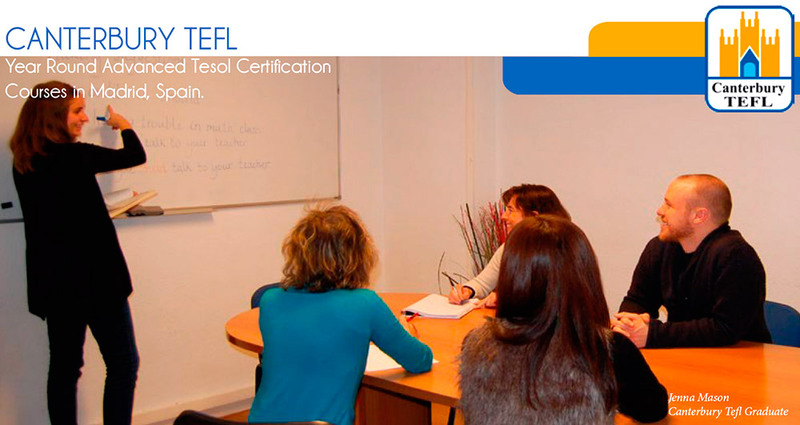 Successful students receive an official TEFL Certificate showing completion of the course and overall grade. They will also be issued a report from Canterbury TEFL, Madrid showing their performance during Teaching Practice. Continuous assessment, course work, projects, portfolio evidence and written assignments. Continuous assessment, portfolio evidence, written assignments, and six hours of practice teaching is assessed for each student in the course. Continuous assessment, portfolio evidence, written assignments, and twenty hours of internship teaching is assessed for each student for different age groups and different English levels. Is the TESOL certification the same as the TEFL? TEFL and TESOL are both certifications for teaching English to non-native English speakers. Both of these certifications offer the same level of qualification to teach English in Spain. The one that’s best for you depends on who – and where – you plan to teach. So, which course is right for you: TEFL certification vs TESOL certification? A TEFL certification provides the skills needed to teach English abroad in countries where English is not the primary language, such as in Spain, in China, or in Japan. The TEFL certification is the most widely recognized and highly regarded qualification of its kind around the world. While a 100-hour TEFL certificate is a minimum requirement set by many hiring bodies abroad, it is important to note that at least 120 hours of TEFL training is the commonly expected standard for the higher salary teaching jobs around the world. This qualification is newer and gives some flexibility as to whether you teach English overseas or in a native-English speaking country, such as in the United Kingdom or in the United States. However, while TESOL certification courses may cover a broader range of topics, they tend to study these topics in less depth. A TESOL certification is not as widely recognized and is sometimes incompatible with some curriculum plans. The course fee is 1075€. However, you must complete 20 hours of real-life internship teaching as part of the course requirements. You will be paid 280€ for these real-life internship teaching hours. You will be teaching paying clients (our guaranteed job offer to you). That is why you will be paid for them. If they were free classes as in other TEFL programs, you would not be paid for the classes at all. This allows us to give you this initial 280€ discount. 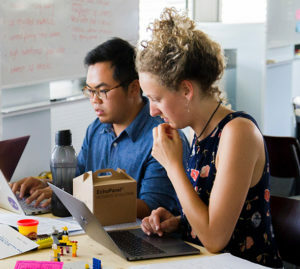 However, you must follow strict lesson planning guidelines and fill out specific reports for these first twenty hours of internship teaching classes. Failure to do so will result in an automatic failure in the TEFL Certification course and you will not be awarded a teaching certificate. If you are paying for both the TEFL and Spanish programs, then you would receive a 12% discount on your Spanish course from our partner school INHISPANIA.